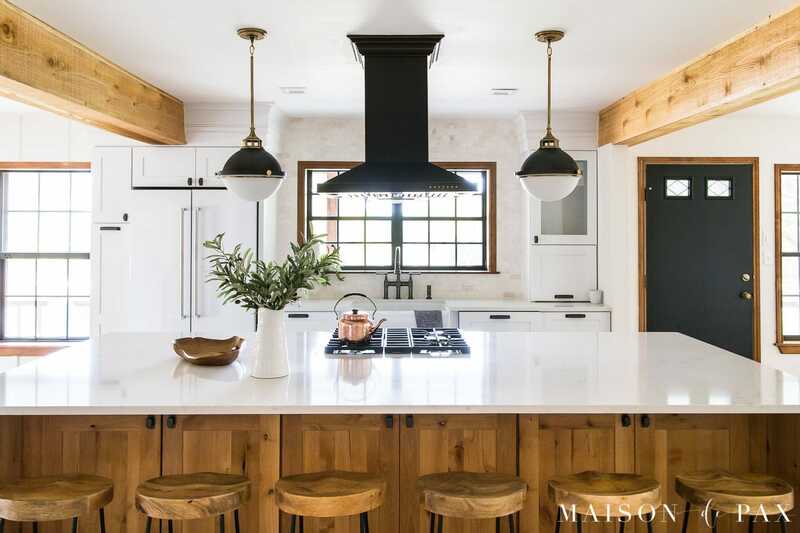 See how an outdated ranch house was updated into a beautiful, open-concept rustic modern farmhouse kitchen. 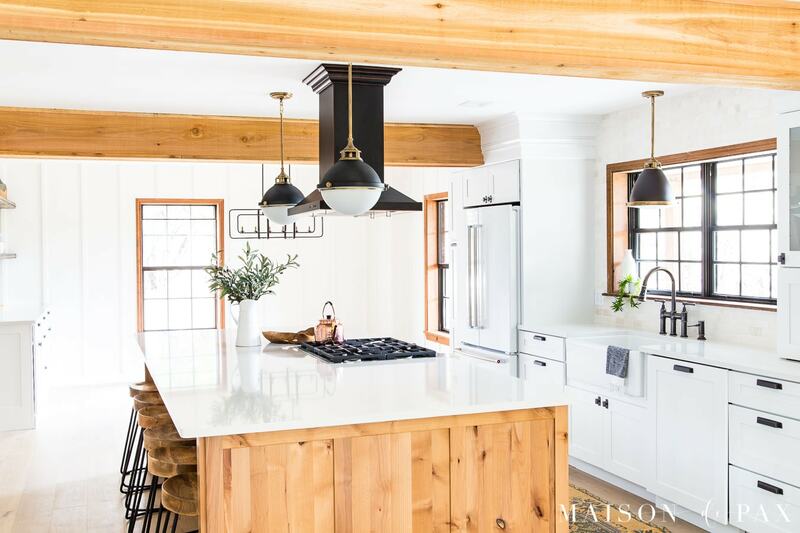 With classic, farmhouse style and elegant, modern convenience, this kitchen/living/dining is now the perfect gathering space! You may have seen the first two parts of this kitchen reveal already: cabinets and appliances. This project has been sooooo long in coming. And I don’t just mean the full year since we bought the property. Nor do I mean the full six months since we started the renovation. 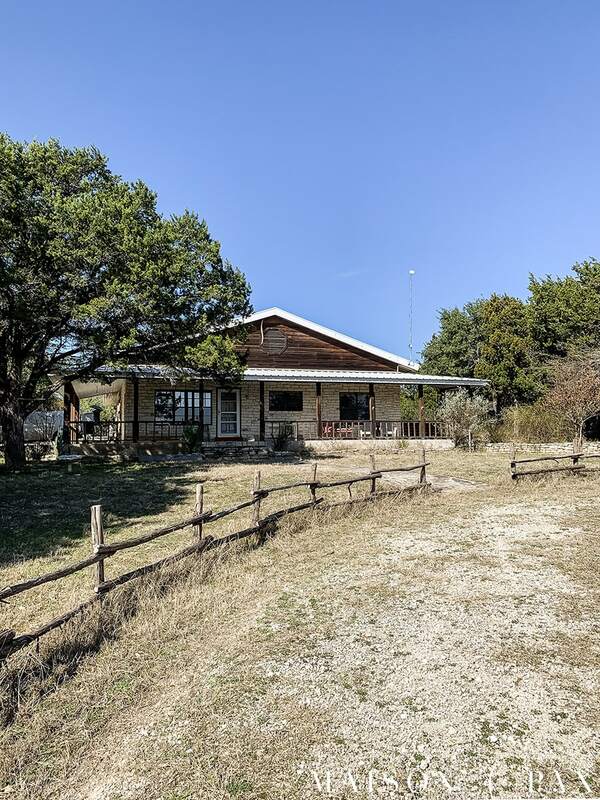 I mean the near decade since my grandmother had to sell her home in the Texas hill country. You can catch up on the story of the property and renovation here. The house started with just 1600 sf of outdated space, but now it’s one unified gathering space… perfect for all our family and friends. 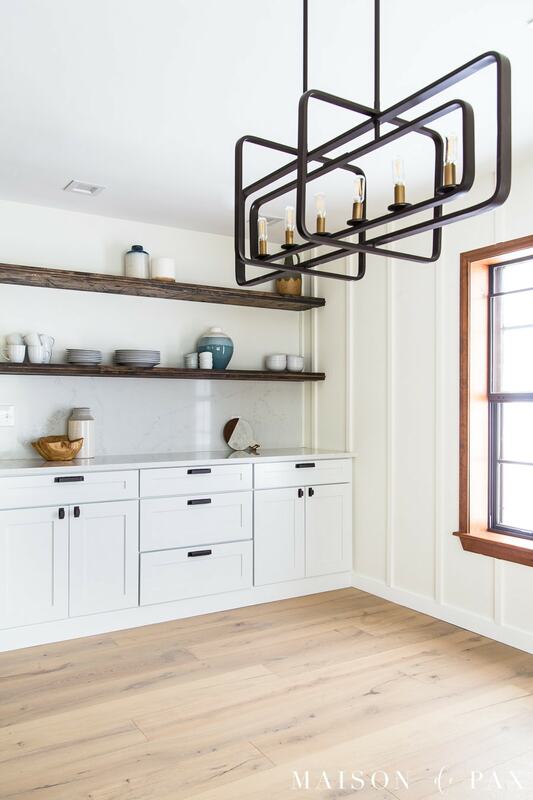 KraftMaid, The Home Depot, HanStone, Build.com, Elkay, Reclaimed Wood Solutions, and Magnolia Home by Joanna Gaines Paint, developed by Kilz have all provided materials for this space. Opinions are all my own. 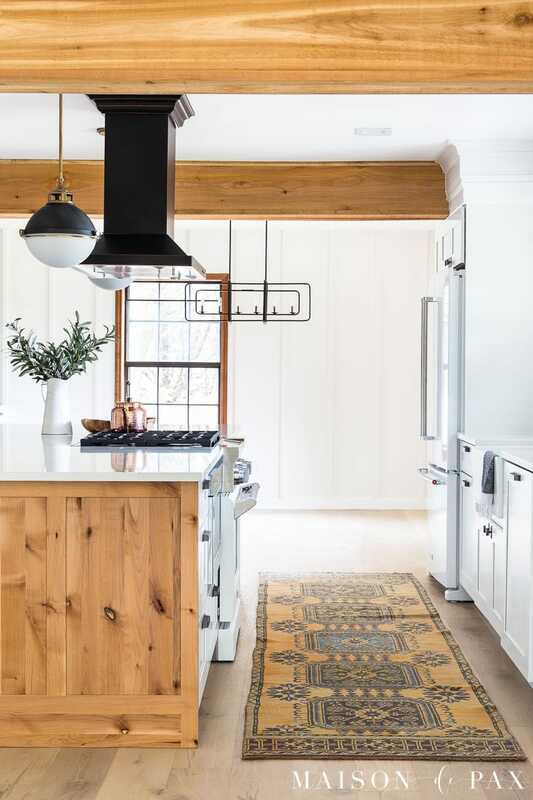 My vision for this space was a balancing act: a rustic, farmhouse feel with modern elegance and convenience. 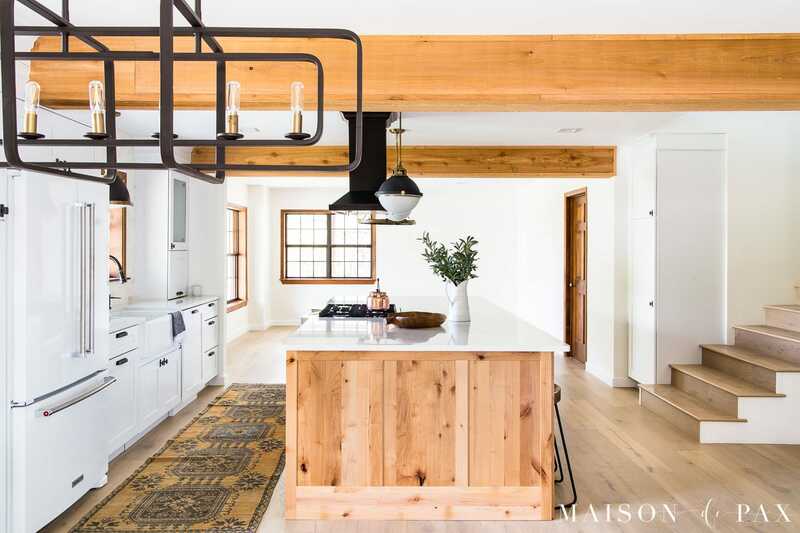 So I couldn’t resist pulling together for you the 10 things that I think helped achieve that rustic, modern farmhouse feel. The first time I entered this space, I envisioned opening it up, painting everything a warm white, and bringing in lots of wood tones. 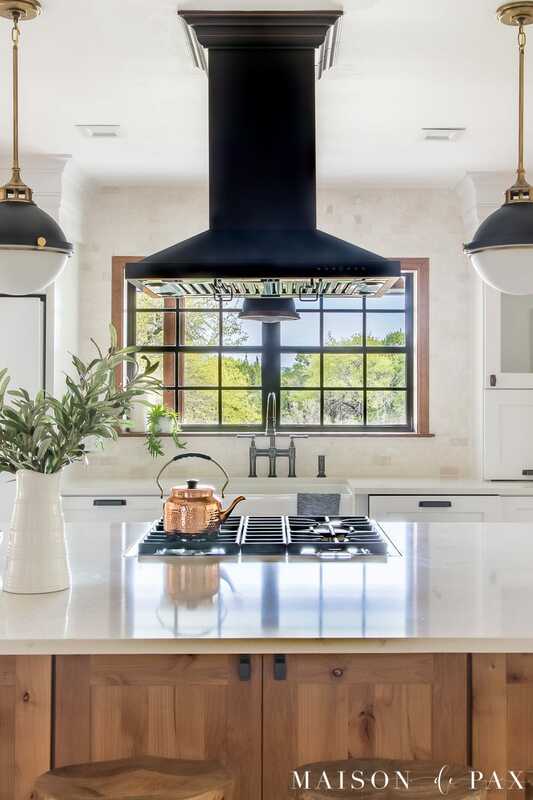 I’m normally a cool-color girl, but warmer tones just felt right for this little ranch house and its Austin stone and cedar exterior… So I partnered with Magnolia Home by Joanna Gaines Paint, developed by KILZ and chose Silos White in eggshell. And it is the perfect amount of cozy warmth without being too yellow. 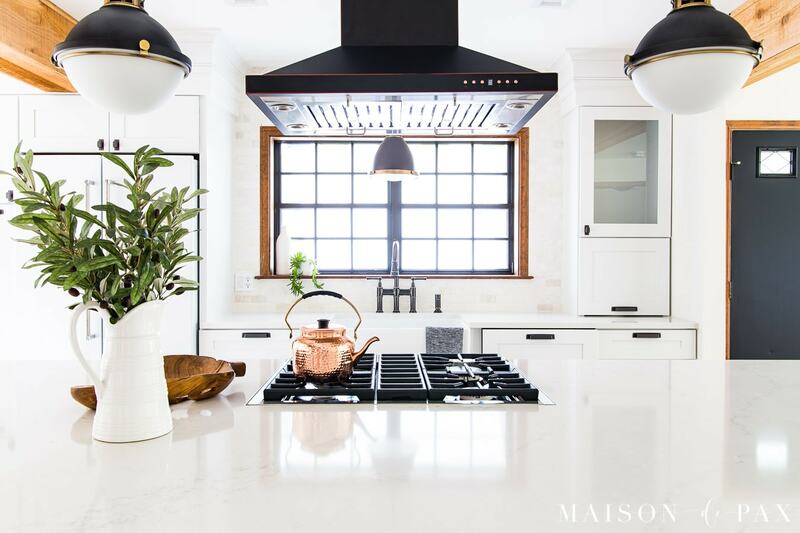 To complement the exterior stone further, I used this warm white marble backsplash in the kitchen. 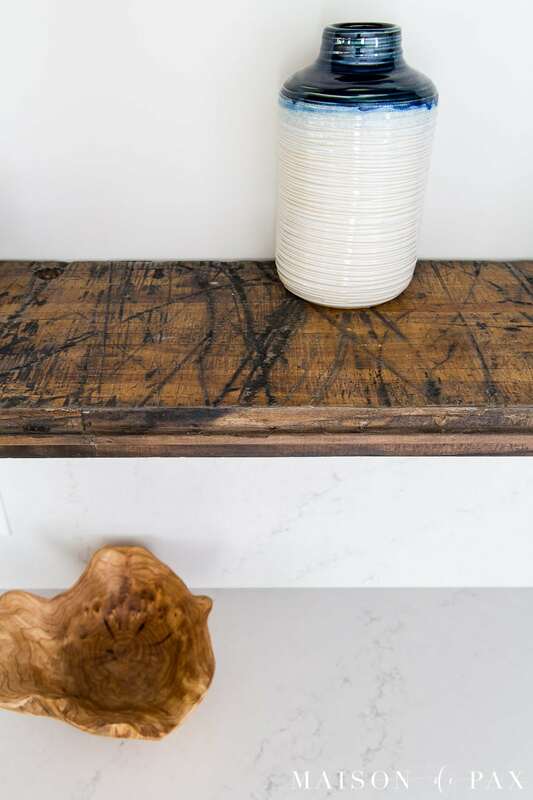 For the countertops, I was looking for a sleek, modern material that still complemented the warm white color palette. 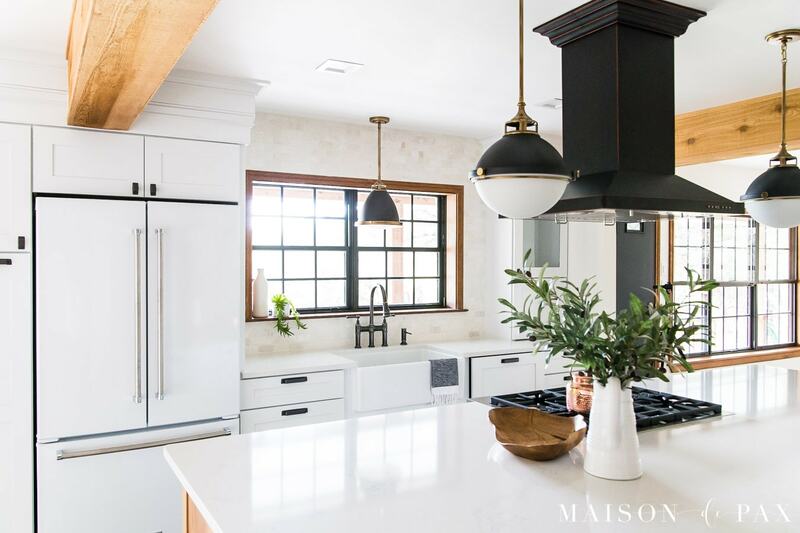 If you’ve followed along for any length of time, you know I’m a sucker for marble, and I knew I wanted this space to have a white marble look but with a mix of warm and cool tones and movement. Since I hope to have family staying here often (and perhaps even rent it out sometimes), low maintenance was very high on my priority list. 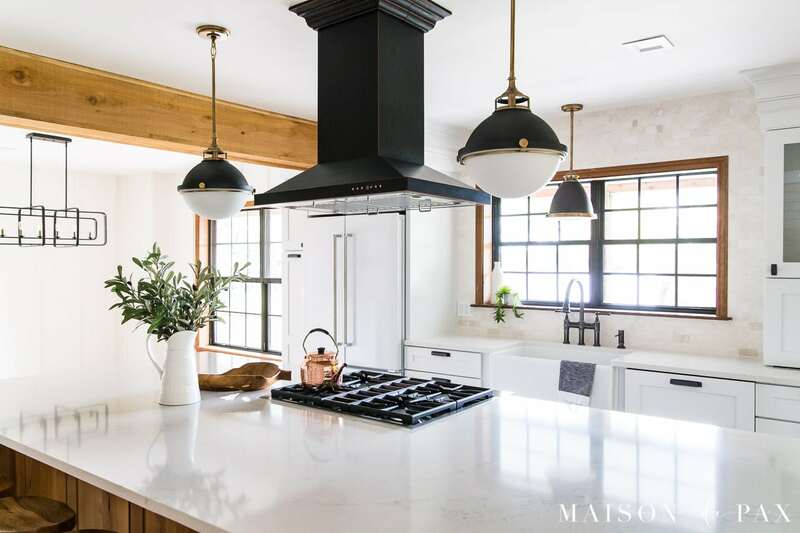 While I love the real marble counters in my current kitchen, I wanted something more durable and less susceptible to etching in this space that others would be using. I’ve examined so many different brands of quartz in the past, searching for something that truly felt and looked like real marble… but many feel fake or look too uniform. So, honestly, I thought I would have to settle for that in this space in order to achieve the durability I was looking for. Boy, was I wrong. All four samples that I ordered from HanStone Quartz looked so remarkably beautiful and real. I had a very hard time choosing. But I landed on the Montauk from their Boutique collection, and I’m so pleased. The mix of warm and cool movement is perfect, and the 3cm thickness and jumbo slabs allowed enough for our giant island without any seams. 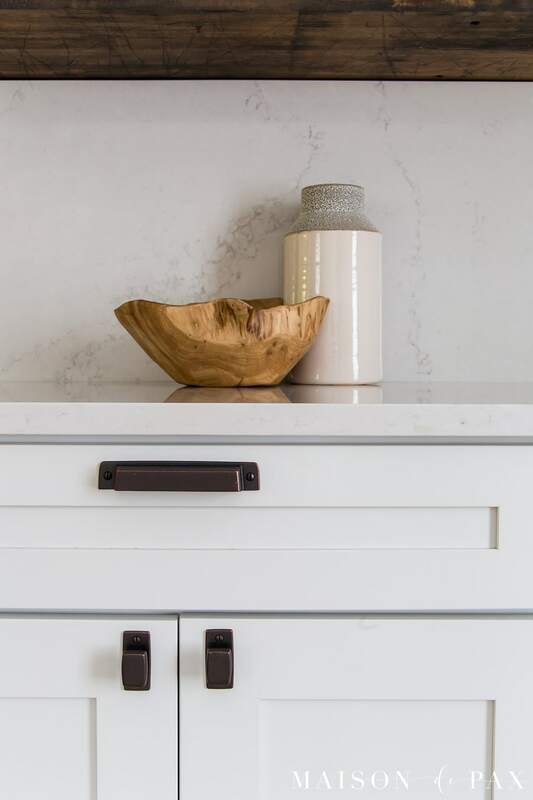 We opted for our fabricators to give it a simple eased edge, and the elegance and simplicity this quartz provides is exactly what I was hoping for. I realize that all the natural light in this space makes it a bit hard to see the depth of the variations in some of these images, but trust me when I say that it’s remarkable. 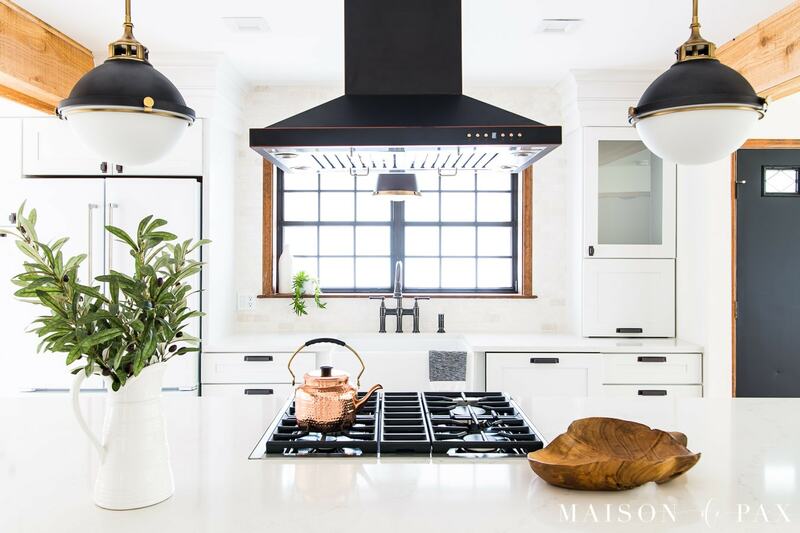 It was so beautiful that I couldn’t resist a 20″ featured backsplash over the counter in the dining space. 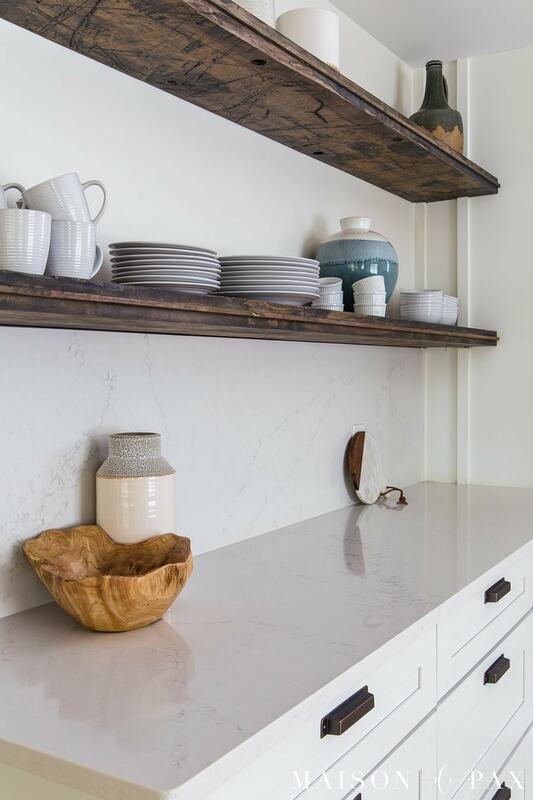 Be sure to check out Hanstone’s product page for even more images of this beautiful quartz or follow them on Instagram for more inspiration and ideas. Speaking of that amazing accent wall, I new I needed to balance the sleek marble with something truly rustic. 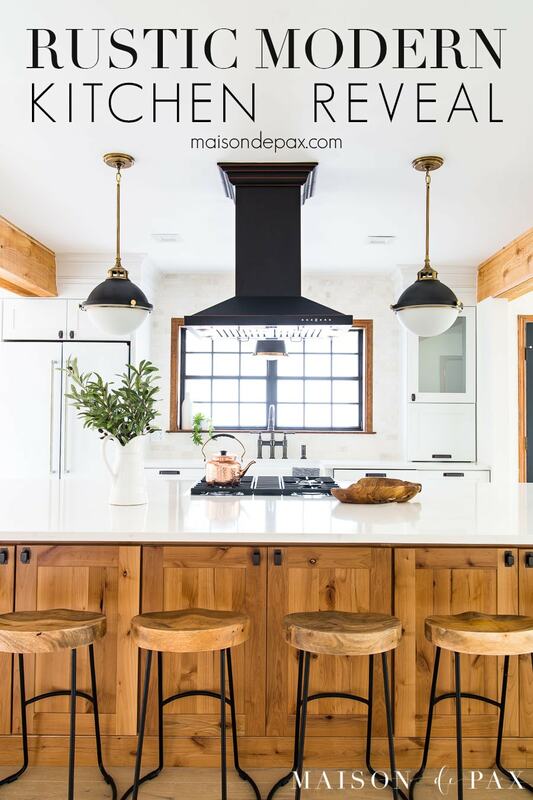 When I found these incredible railcar planks from Reclaimed Wood Solutions, I knew they would be perfect. 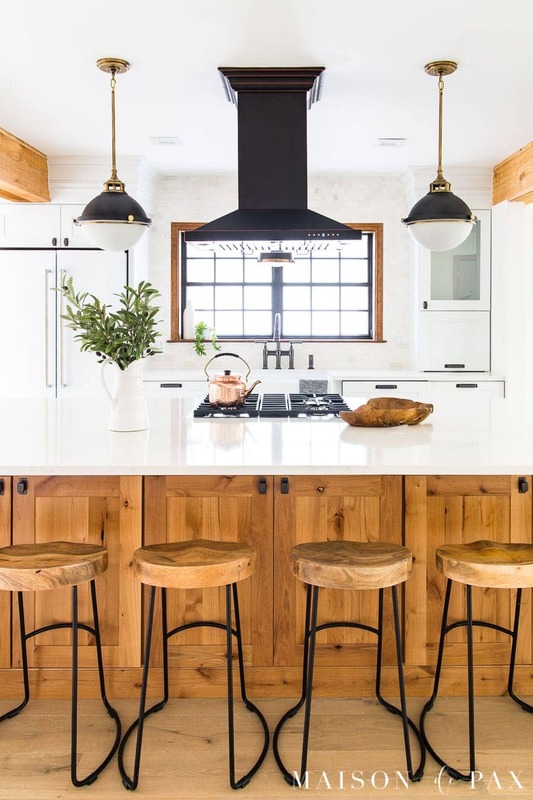 Reclaimed Wood Solutions has a variety of reclaimed wood that can be used for countertops, islands, furniture, shelves, and more. I opted to leave these planks as natural as possible, even keeping the tongue on the front edge. Ahhhh… the jewelry of a room. It’s like adding a pair of diamond earrings to an otherwise classic but simple outfit. I couldn’t be more excited about partnering with Build.com to elevate this space with these incredible Hinkley lights. They provided just the elegant, modern complement the space needed with a touch of industrial feeling to add drama. 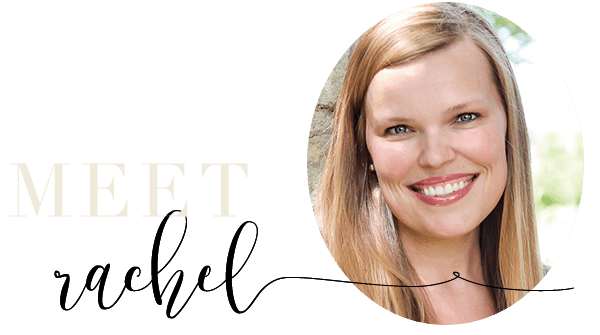 I will definitely share more when I reveal (and actually furnish – ha!) the living and dining rooms, but for now, you can see we chose the Everett chandelier for the living room. I love the addition of the brass accents to the otherwise rustic wagon wheel shape. And for the dining room, this incredible modern twist on a traditional elongated lantern is just so amazing. 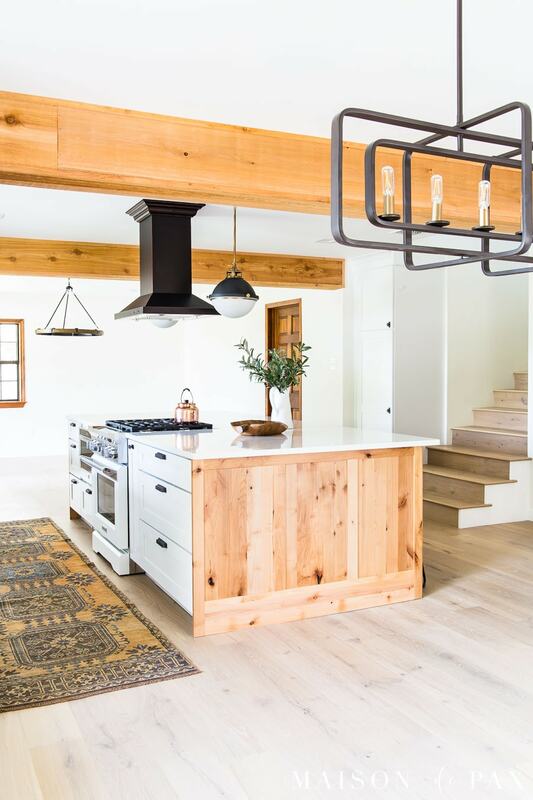 What started my passion for these beautiful Hinkley lights, though, was the Fletcher pendant that we hung over the island. 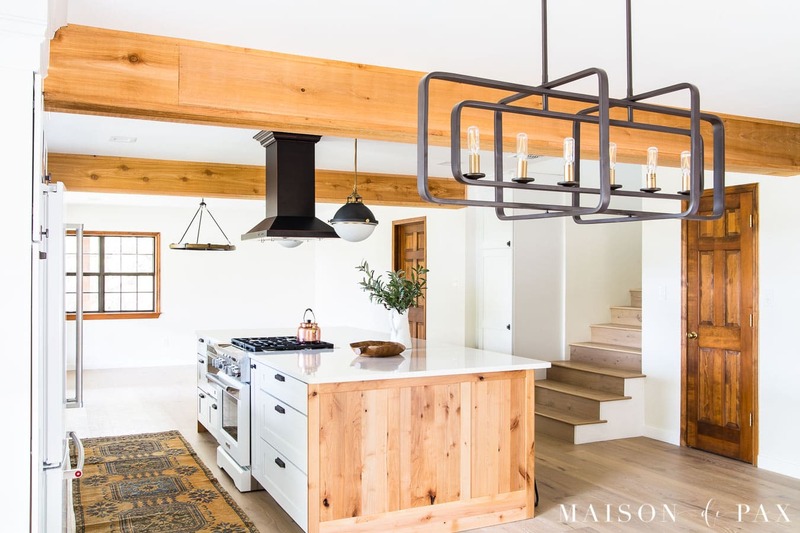 I spotted this beauty before we even demoed the existing kitchen, and I knew it would be the perfect industrial/classic/modern touch to our rustic ranch kitchen. And the Amelia pendant seemed a perfect complement to the others for task lighting over the sink. I cannot say enough about the quality and beauty of these lights and the elegance they lend to the space. Remember the balancing act? Enter the next rustic element: chunky cedar beams. Taking down the walls between the front three rooms was key to my vision for the space. Since we also built out the attic (more to come on that later), we needed significant support beams. 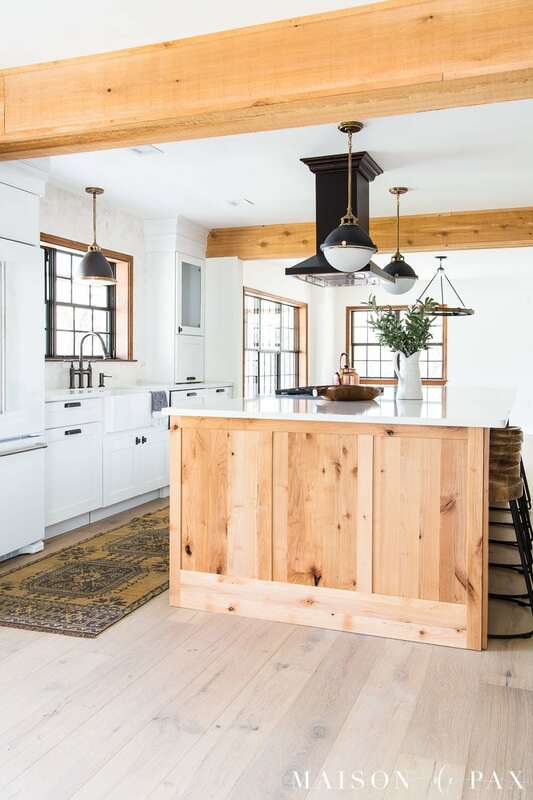 We opted to simply encase the beams with raw cedar planks, and I cannot believe how well they complement the cabinets we chose for the island. I love the single-basin farm sink we have in our other home, so it seemed natural to repeat that choice here. 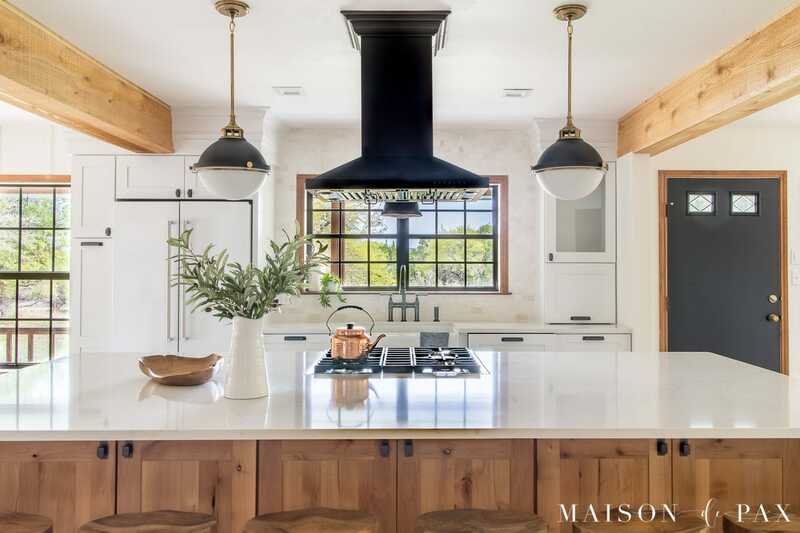 Elkay provided this beautiful sink and faucet for the project, and I love the sleek profile of the farmhouse, apron-front sink. 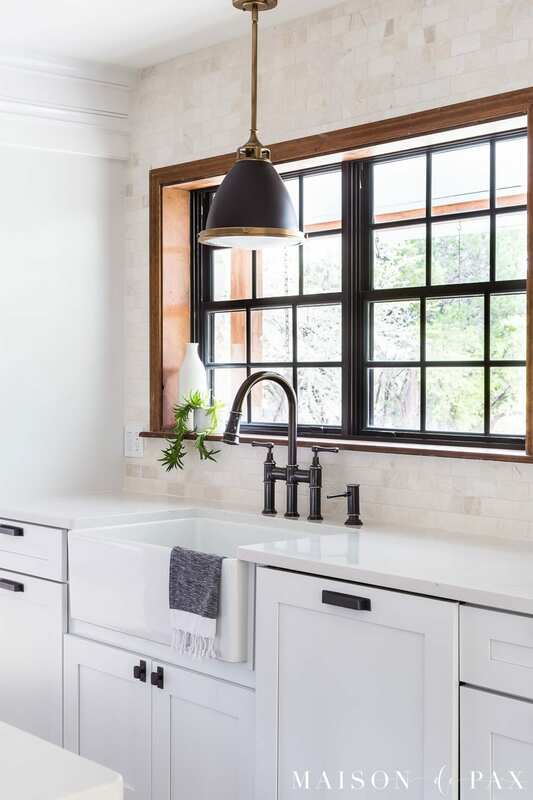 I also love the slightly industrial but still classic bridge style of this faucet and soap dispenser, and how they plays off the other black elements of the space… the perfect icing on the industrial modern farmhouse feel we’ve got going on in here. 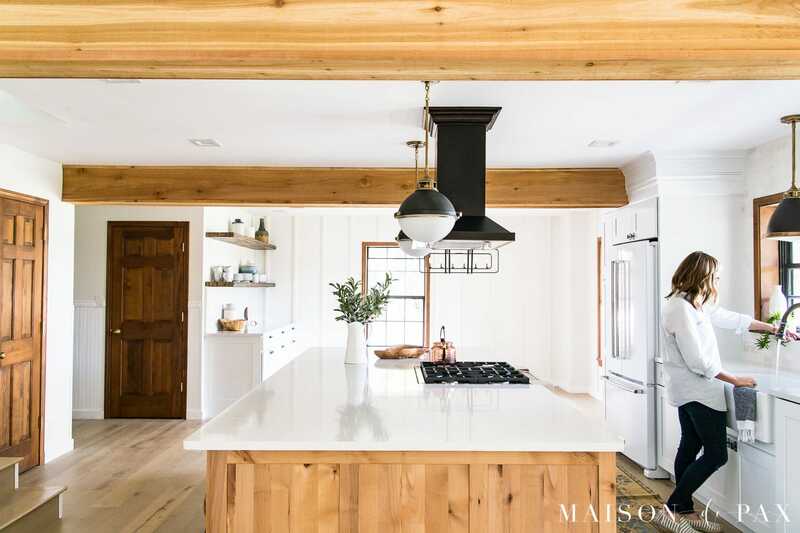 Another obvious change that lends to the farmhouse charm throughout the space was new flooring. We ripped out all the old tile and laid these beautiful engineered wood floors by Greenworld Industries throughout the home. It’s actually the same line we put in our other home almost four years ago (and still love! ), but this color is called Rivera. I think the 7.5″ plank with its beautiful light wash speaks for itself. 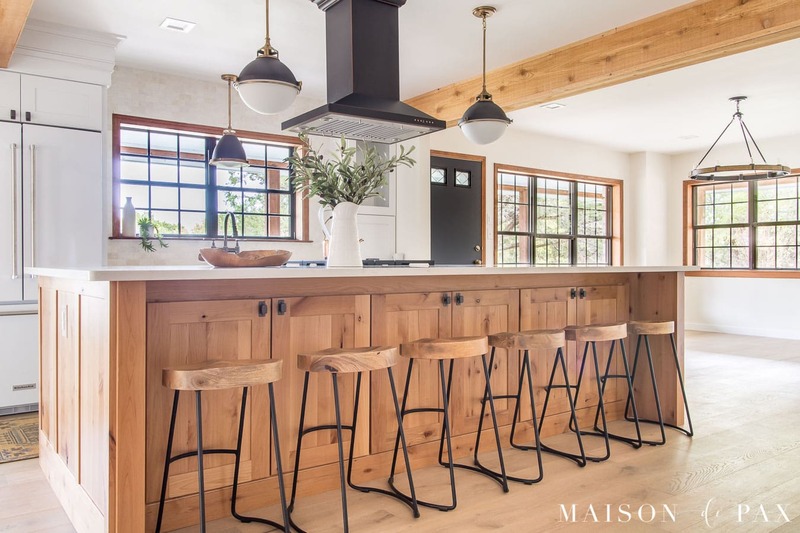 Some people are nervous about wood floors in a kitchen, but as I said, we’ve had these floors in a different color in our current home – including the kitchen – for almost four years and absolutely love them. (Edited to add – because I got so many questions about it! 😉 ): We protect our wood floors near the sink with a vintage runner, like this beautiful Turkish one I found on Etsy from this seller. Since it’s vintage, it is one-of-a-kind, but the seller has quite a variety and some that are similar to mine, so you might take a look at his other inventory. You can also see my post on where to buy affordable vintage rugs here for more ideas. 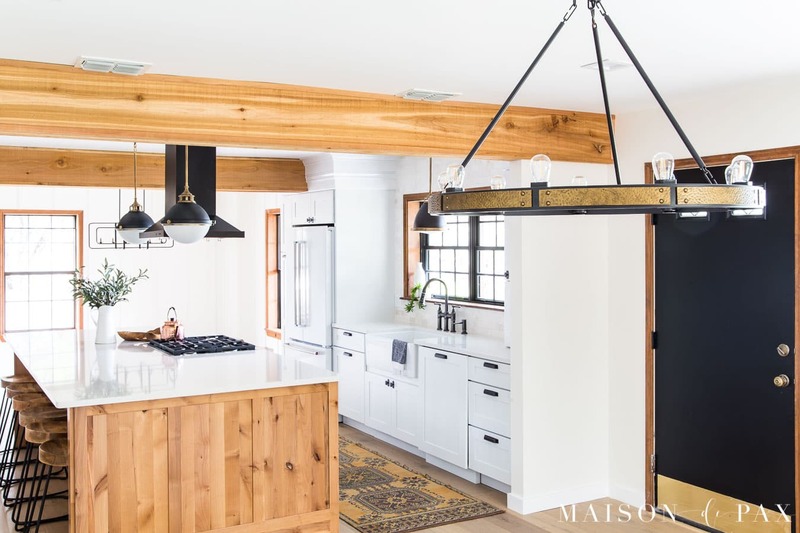 I shared a lot more about this before, but suffice it to say that a combo of the rustic wood island and the crisp, clean white cabinets was just the rustic-modern contrast I was looking for. 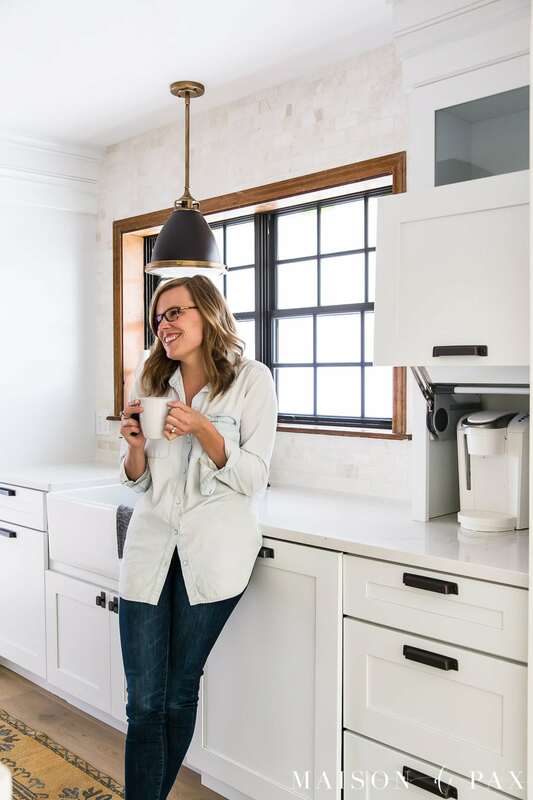 Planning the design of this kitchen was both instant (I had the vision the moment I walked into this home about a year ago) and very slow (working out every detail took so. much. planning.). 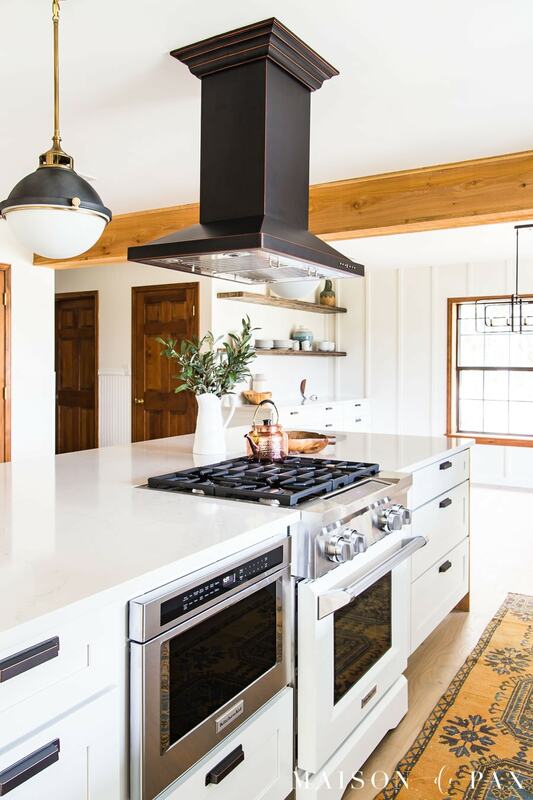 Open-concept kitchens are obviously a more modern design style, but an essential element to our vision for this little ranch home. The giant island with the long bar was paramount. We hope to house lots of family and friends here, and the many seats at the bar offer both a gathering point and extra space to feed people. These little barstools will be perfect for packing them in. And the open sight lines meant that appliance choices were very important to the overall aesthetic. You can read more about our appliance choices for the space here. And that’s the basic tour. I will be back with more details, including a living room and dining room reveal soon, I hope! In the meantime, what do you think?? We couldn’t be more thrilled. And be sure to pin it! Wow again. Everything is so spectacular. You truly out did yourself. Just beautiful. Hopefully you and your family will enjoy it for many years to come and make so many special memories. Thank you for your kind words, Dorenda! 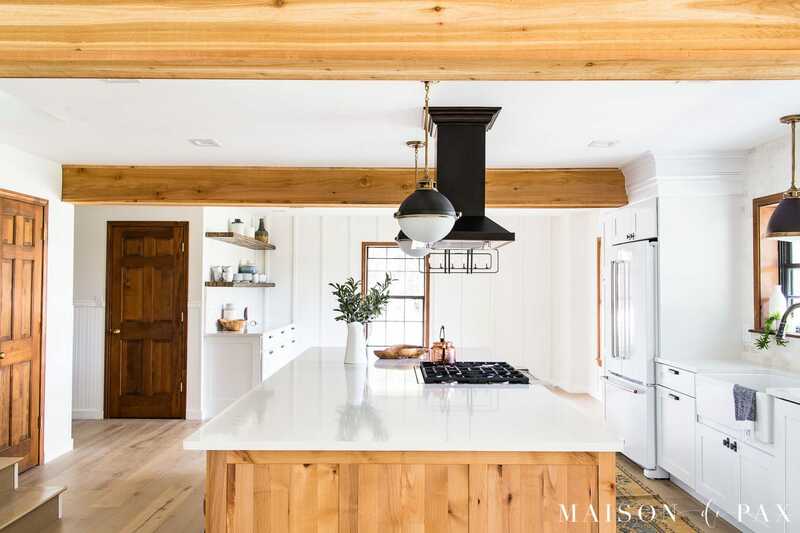 Your farmhouse kitchen is so open and light-filled! A wonderful place to fill with family and/or friends! Thanks for the generous peak! Have you given a source for the beautiful rug in this space? Thank you, Linda! The rug is a vintage Turkish rug that I found on Etsy from this seller (affiliate): https://rstyle.me/+dT9pu0RGE_Fx-B4MJ666-Q Since it’s vintage, it is one-of-a-kind, but he has quite a variety and some that are similar to mine, so you might take a look at his other inventory. 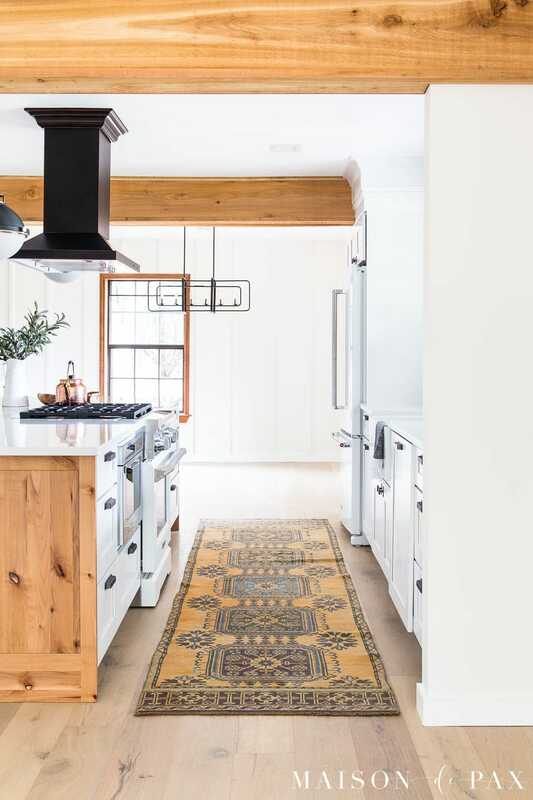 You can also see my post on where to buy affordable vintage rugs here for more ideas: https://www.maisondepax.com/where-to-buy-vintage-rugs/ Hope this helps! Wow, the space looks amazing! 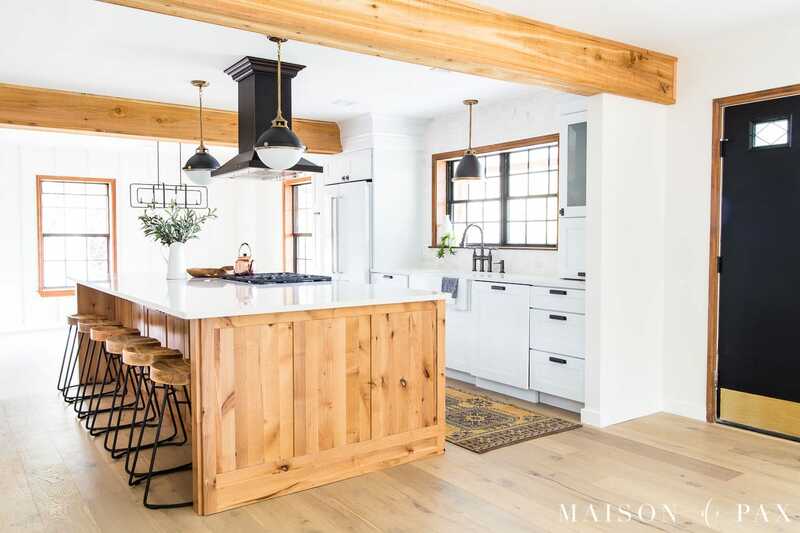 I love the reclaimed railcar planks that you used for the floating shelves- the perfect rustic element to compliment the buffet. Thank you! I love those new shelves too! Really a wonderful place and i expect to pictures of family and friends of this pretty and wonderful space,lol!! Well, i hope you will share a few. Thank you, Marlene! I hope it’s a place for us all to gather and make new memories. Wow, this is truly a work of art ! Wow! It’s gorgeous and you did all of this for free? How is that possible…when you are sponsored and given products by a company…don’t you have to pay something?